If you take a walk along Chestnut Grove in Balham, you’ll be surrounded by a myriad of different retail outlets, all shouting for your business. It would be quite easy to miss Brother Marcus though, their signage is all rather understated; no flashing neon, no pretentious signs, just quite literally “Brother Marcus”. The team behind this culinary delight - Alex Large, Arthur Campbell and Tasos Gaitanos would prefer to let their food do the shouting for them, and it certainly does that. You can clearly see that these three school friends have a passion for high quality, organic food, but a quick read through of the menu shows that they’re having fun whilst serving up modern, tasty food; The Pollocks, Hamma Mia and The Notorious P.I.G all feature somewhere on the menu. Labelled as a ‘Garden Café’, Brother Marcus is all about serving up good food in a friendly environment; it’s the sort of place you could go for lunch and leave much closer to the following day after staying for dinner and the odd glass of wine or house cocktail. They can seat up to 35 people inside the café, with space for a further 28 in the actual garden (where they grow their own micro-herbs), and whilst it can get busy, it’s never overcrowded, but if you wanted formal dining (and the associated space), you’d be eating elsewhere. 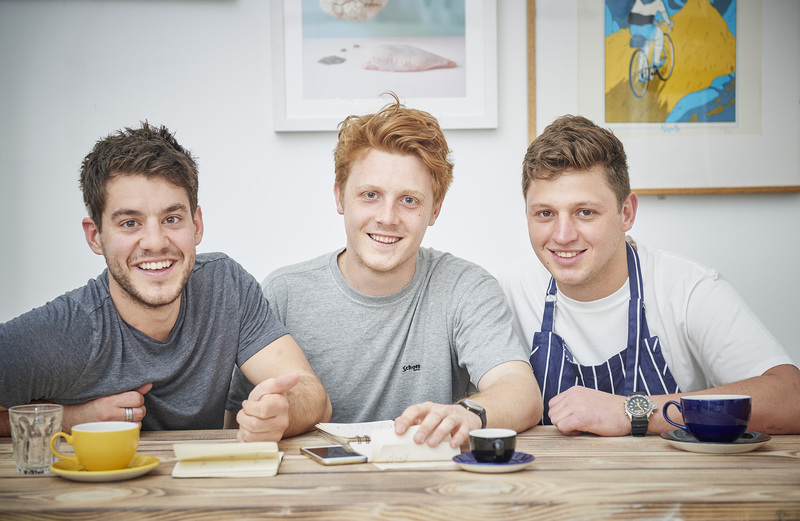 Whilst they all look fresh-faced and young, Alex, Tasos and Arthur have a wealth of experience behind them, from street food to coffee to restaurateur, and it shows. They may be having fun with some elements of the menu, but when it comes to the food, they are all over it; how does a slow roast pulled pork, crunchy apple and rocket salad, lime yoghurt, crispy corn and dirty Mexican sauce (on a fresh focaccia bun) sound? Or garlic and thyme roast Portobello mushrooms, grilled Somerset goat’s cheese, rocket with a honey mustard dressing, topped with parmesan crisps? The beauty of Brother Marcus is relaxed dining, in a comfortable environment with high quality and organic food, served properly. Perfect for dining out with family and friends, although you should be aware that more often than not, you’ll find people queuing to get in at the weekend. And yes, I know you’re wondering; Brother Marcus really is brother to Alex!